The Formula 1 Grand Prix resumed its season after the Asia rounds as they head out to Europe and it was a good outing for Red Bull Racing at last weekend Turkish GP when both its drivers finished with a one-two podium finish. It was an excellent race for the current world champion Sebastian Vettel where he led the race from pole to finish. The 58 lap race also saw Mark Webber crossing the finishing line on second place. Coming up third is Ferrari’s Fernando Alonso, who got the first podium finish for the Prancing Horse. Meanwhile, another former world champion Lewis Hamilton of McLaren could not continue his good run in the previous race where he took home the chequered flag and could only conjure up a fourth place finish. He overtook Nico Rosberg who began the race on third. Michael Schumacher meanwhile had one of his worst ever finish since returning to F1 where he only finished twelfth. This was widely due to the car which suffered a broken wing. On sixth place is Hamilton’s team mate Jenson Button while Nick Heidfeld and Vitaly Petrov from Lotus Renault followed suit. Sebastien Buemi and Kamui Kobayashi completed the list to finish in the points. Team Lotus who had claimed to have finally made it to the midfields could only finish 18th and 19th which again is very much status quo where they won the driver from Virgin and Hispania Racing. With this result, Vettel breaks further ground ahead where he is now 93 points, way ahead of Hamilton who has 59. Vettel’s teammate Webber is third with 55 points while Button has 46. Alonso is close by with 41 points. In the constructor’s championship meanwhile, it looks like Red Bull is yet again in pole position to retain its title where they now have 148 points, 43 points more than McLaren who has 105. Ferrari seemed lost in the wilderness with 65 points in third. The next race will be in Spain where the circus travel there in the next 2 weeks. 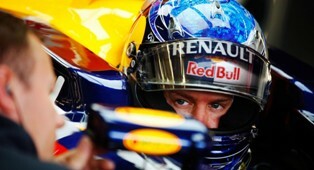 As it looks now, Vettel is determined and his finishes look very much strong for him to retain his title.